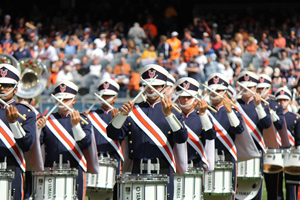 The Marching Illini is one of ten bands to perform in next year's parade in New York City. The news was announced today to the musicians by Director Barry Houser and Chancellor Phyllis Wise. The Marching Illini will be traveling to New York City come November 2015 as one of the four collegiate bands chosen to perform in the 2015 Macy’s Thanksgiving Day Parade. Of a list of over 175 marching bands, the parade coordinators chose 10 marching bands, and the Marching Illini are one of four college bands that will be partaking in the parade. Eager students, many members of the Marching Illini, filled the Harding Band Building on Friday morning, awaiting the news that band director Barry Houser had been keeping under lock and key for weeks now. Accompanying him were Chancellor Phyllis Wise and Wesley Whatley, creative director for the parade. “The suspense has been growing for a while,” Houser said. Whatley made the announcement upon presenting the Marching Illini with a drumhead to commemorate the accomplishment. In a statement from Macy’s, Whatley said the selection committee looks to recognize bands that have a kind of stage presence that can captivate national audiences. “It’s my job to look across the country and identify schools that are the finest in the country – certainly the finest in what they do – and more specifically music programs,” Whatley said, adding that the University is one of the finest in his professional opinion.